This was a true story that happened long long ago, during the end of dwa:para yuga, approximately 5000 years ago. Dhruthara:shtra was the brother of the Late King Pa:ndu, a blind by birth. He had 100 children. Duryo:dhana was the eldest son of them all. So, Duryo:dhana was ruling the kingdom of Hasthinapura, on behalf of his father. He was an arrogant and cunning person by nature. The King Pa:ndu had 5 children only. Yudhishtira was the eldest of Pa:ndavas. He was also called as Dharma Ra:ja, by virtue of his nature. Bhi:mase:na, Arjuna, Nakula & Sahade:va were Yuddhishtira’s younger brothers. All these were well disciplined and always lived truthful in all respects. Draupadi was their wife. She was a pious lady and sincere devotee of Lord Krushna. Mischieveous Duryo:dhana played a cunning game, which resulted Pa:ndavas to spend 12 years of their time in the forest. They had also spent 1 year in secrecy, under the shade of King Vira:ta. After finishing 13 years of their exile, Pa:ndavas came out and there were many negotiations for peaceful settlement of their share in the kingdom. The Kauravas did not agree at all with Pa:ndavas and ultimately it resulted in a big war. That war became famous as MAHA: BHA:RATHA WAR. It was continued for 18 days. 18 akshauhini:s of soldiers participated in that war. Out of them, 11 akshauhini:s were with Kauravas and only 7 akshauhini:s were with Pa:ndavas. 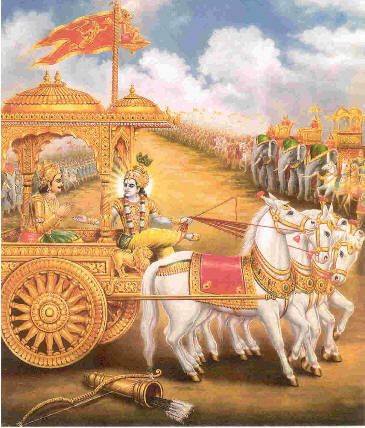 Lord Krushna also was participating in that war, as a charioteer for Arjuna, but holding no weapons. According to the available sources – 21,870 chariot force, 21,870 elephant force, 65,610 horse force and 109,350 soldiers will become one akshauhini. Then, there minimum 2 people will be in each chariot, one to drive and the other to fight. And, 2 warriors will be there on each elephant back, again one will be guiding the elephant and the other one to fight. Now in each akshauhini there will be a minimum of 47,23,920 warriors will be there, other than the animals. Alas! And now, you can imagine howmany people were participating in the whole of Maha: Bha:ratha War. Unfortunately, by the end of war no one was left alive among all the warriors, except 5 pa:ndavas and just a handful of others, here and there. Bhi:shama:charya the Great, was leading all the forces of Kauravas. He was the grand father of all the Pa:ndavas and Kauravas. He was a bachelor and a very virtuous person. Whereas Dhrushta dyumna, the brother of Draupadi, was appointed as chief commanding officer of Pa:ndavas army. Before starting the war, Sage Ve:davya:sa, the Great, came to Dhruthara:shtra to do some favour, if interested. The Sage Ve:da Vya:sa asked him whether he was interested in having sight to witness the war. Unfortunate Dhruthara:shtra denied. But requested the sage to sanction that boon of ‘witnessing all happenings of war from his own place’ called divya drushti to his close companion Sanjaya. The sage Ve:davya:sa did so and left on his own. Sanjaya was a charioteer for Dhruthara:shtra and also his counselor. He also was a strong devotee of Lord Krushna, but very honest in serving his own boss, the blind Dhruthara:shtra. The war started just before the first day of the month Ma:rgasira, according to the Lunar calander. While the war was about to begin, Arjuna was suddenly overwhelmed with sorrow. He refused to wage the war. As if to convince Arjuna and put him back on his duty, i.e. waging the war, Lord Krushna preached him so many truths of life. That sermon in the war field became famous as “BHAGAVAD GI:THA”. This world renowned scripture makes man dutiful, relieves from all sorts of distress and shows a right path, when refered to, with all faith. The Holy Bhagavad Gi:tha, a Celestial Song with 700 slo:kas in it, was divided into 18 chapters. Each chapter is called an adhya:ya. Each adhya:ya again named after some ‘yo:ga’. There are many meanings explained to the word yo:ga in Sanskrit language. But in Bhagavad Gi:tha, while taking the names of adhya:yas, the word ‘yo:ga’ was used to say that it is a ‘means’. A means, a mode, a method, a way etc., are all synonyms. To get rid of any type of misery in the life, there are many ‘yo:gas’ , the ways or solutions recommended to a seeker. Our duty is to understand them and follow. We can come out of any problem, overcome the sorrows and can not only lead a joyous life but always successful in all our endeavor. The Holy Bhagavad Gi:tha is thus relevant not only for now but forever. 10 days were passed. Dhruthara:shtra was so confident on his forces, and did not ask for any details of the war. But, on the 11th day of The War, Dhruthara:shtra got a shocking news that their commander-in-chief , the great Bhi:shmacha:rya, fell down in war field. He was so moved and called Sanjaya on to him and started asking for the details for the war. Having blessed with the ‘divya drushti’ Sanjaya was able to perceive the whole state of affairs and started revealing each of them to his boss Dhruthara:shtra. Though the Lord spoke ‘Bhagavad Githa’ on the beginning day itself. Yet, no one knows about that preaching. Probably everybody was in a state of trans. It was brought into light, only through Sanjaya, on the 11 day, when Sanjaya was asked by the King Dhruthara:shtra. In view of that, the 11th day of the month Ma:rgasira was regarded as ‘GI:THA JAYANTHI’. Chanting the whole of Bhagavad Gi:tha is a blessing, on this day. If, that is not possible, reciting as many slo:kas as possible, or chanting atleast a few hymns of it, also adds a lot of good to us. Thus, began the the Bhagavad Gi:tha with a question of Dhruthara:shtra.